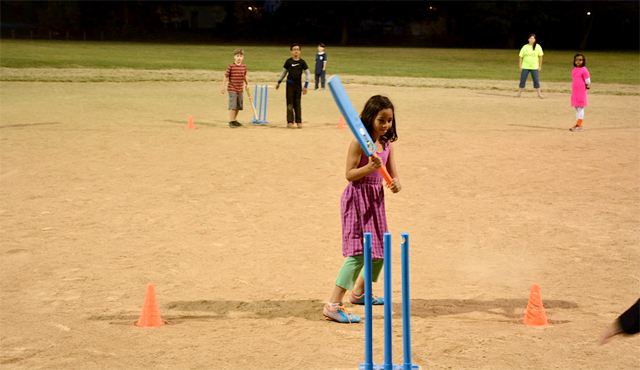 Missouri Youth Cricket Association (MYCA) has successfully completed a six-week cricket camp in the City of Ferguson. The camp was conducted on Monday evenings at Forestwood Park, and was led by MYCA Officer Christina Tucker. The initiative started with a four-hour camp at a Ferguson community event in July. There was overwhelming participation and interest from the Ferguson community at this event. MYCA would like to thank Jonathan Gehrin, Recreation Supervisor with the City of Ferguson, in working closely with MYCA and setting up this six-week cricket camp. Forestwood Park, located in the heart of the City of Ferguson, includes eight baseball diamonds, a children’s play area, walking trail, etc. It is one of the busiest parks in Ferguson, so we had quite a few observers to our camp. For many in the community this was their first encounter with the sport of cricket. Quite a few people stopped by to enquire more about the sport and some children just walked in and joined the camp. This camp was a part of MYCA’s Community Outreach Program, where we intend to spread awareness about the sport of cricket in the community. We do not expect people to immediately start playing the sport and start competing. Our youth camps are non competitive, fun and friendly where, apart from basics of the game, we show the children and parents how cricket is great example of building team spirit, patience and friendship. It is not “mission accomplished,” but it is a positive step in the direction of taking the sport of cricket closer to the local Americans. MYCA continuously strives to create new opportunities to connect with the community and promote the sport of cricket.